Now, no beauty blushed and dimpled along the sides of the Cranford Assembly Room; no handsome artist won hearts by his bow, chapeau bras in hand; the old room was dingy, the salmon-coloured paint had faded into a drab; great pieces of plaster had chipped off from the white wreaths and festoons on its walls; but still a mouldy odour of aristocracy lingered about the place, and a dusty recollection of the days that were gone made Miss Matty and Mrs. Forrester bridle up as they entered, and walk mincingly up the room, as if there were a number of genteel observers, instead of two little boys with a stick of toffy between them with which to beguile the time. When I was reading Cranford today, I came across this lovely passage and was instantly put in mind of our wedding day (as if I need an excuse). Our reception was held in the old Winchester Assembly Rooms which have just such salmon walls and plaster moulding and the same slightly sad air of faded grandeur that Gaskell describes. 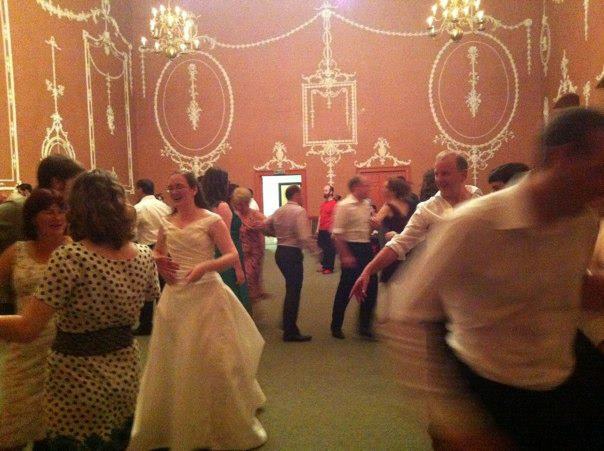 Unless someone told you about this place you would never even know it was there, so it felt wonderful to revive the place with some proper dancing (though probably much less decorous than any Jane Austen would have witnessed if ever she visited) and laughter, if only for a night. Thank you! It was a magical day and the perfect setting just topped everything off.